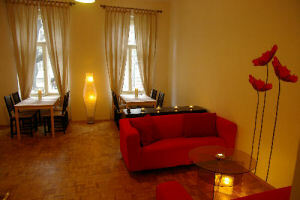 This is a really beautiful apartment close to Namesti Míru in the very nice district of Vinohrady in Prague 2. 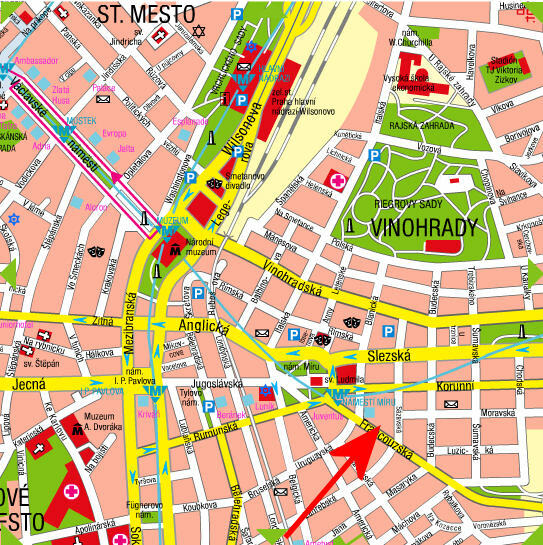 It takes only 10-15 minutes to walk to Vaclavske Namesti (Wenceslas Square) and there are very good connections by metro and tram just around the corner. The district of Vinohrady is quite exclusive and it was here the more wealthy people built beautiful houses in the late 19th century early 20th century. The area is relaxed and has many nice shops, bars/pubs and restaurants, and very close to this apartment you’ll find a shop with everyday necessities, open 24 hours. The apartment is situated on the first floor of a building with an elevator. It has been completely reconstructed using high quality materials, and it is large, bright and inviting. The furnishing has been done with attention to detail, and a lot of love has been put into the project leaving a result far more welcoming than usual. 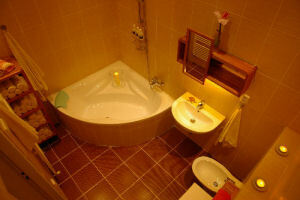 The accommodation comprises 3 bedrooms, a living room with kitchen corner, and two bathrooms. The largest bedroom is furnished with a double bed and two single beds. Here you’ll also find two comfortable armchairs and a satellite TV with a surround sound system – so in fact an extra living area. In the second bedroom, which is also quite roomy, there’s a double bed, an extra table with a couple of chairs and a cozy armchair. The third bedroom has a double bed. All three bedrooms have nice illumination and plenty of wardrobes. The apartment has room for 8 guests. The living room has been furnished with two comfortable sofas and dining room tables for 8 persons. There is a new and well equipped kitchen corner with a gas hub, electric oven, microwave, cooker, coffee maker, large fridge with a freezer, toaster, washing machine and all the utensils and cutlery you need. There are two very nice bathrooms. The largest one has a comfortable corner bathtub, toilet and bidet, and the other bathroom has a walk in shower and toilet. In both bathrooms you’ll find a heated towel rack.